I am trying to master breathing when swimming. How do I control my breathing...(I find that I do not have enough breath whilst gliding across)? The most comfortable method of breath control is trickle breathing. This is the act of slowly breathing out into the water whilst swimming or gliding. Holding your breath is an easy mistake to make, especially if you are learning to swim. Breath holding increases levels of carbon dioxide in the body which then increases the urgency to breathe. Breathing out into the water expels the carbon dioxide and makes inhaling another breath a calmer and more relaxing action. The amount of breath, or volume of air to give it its correct term, is determined directly by the volume or size of your lungs. The rate at which your body uses the oxygen in your lungs is determined by your aerobic capacity, in other words, your fitness level. After all swimming is a very effective form of exercise and those learning to swim usually find it an intense cardiovascular workout simply because it is a form of exercise they are not used to. As your fitness level increases your breathing will become easier. Keep practicing and you will get there. 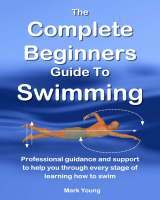 My ebook The Complete Beginners Guide To Swimming contains a chapter all about breathing, including when and how to breathe, plus all the technique tips for learning to swim the four basic strokes Click the link below for more information. Should I Exhale When Swimming? I would like to know if I should exhale when swimming? I have been swimming for just over a year and I'm 27. I swam a little when I was younger but not competitively. I am attending a swimming club twice a week which, to be honest, is pretty advanced/intense. I am doing smaller drills compared to the others but still find myself breathless after 100m for example. Sometimes after 30mins of the session, I take note of what I am doing and notice that I am only inhaling out of the water and not doing anything while I'm submerged in the water. I hear this is bad!? What you are describing is not necessarily bad, but sounds pretty common. It is a good thing that you are taking note of what you are doing and you will have noticed that your breathing pattern changes as you swim for longer periods of time. From what you are describing it sounds like as your body begins to work harder aerobically you are switching from trickle breathing to explosive breathing. Trickle breathing is exhaling out into the water during the stroke and at the point you need to breathe, you only need to inhale. Explosive breathing is holding your breath during your stroke and at the point of needing to breathe; you exhale and inhale in the short second your head is turned. Explosive breathing is often harder and more energy consuming. If you forget to exhale then you really are making life hard for yourself! There is no right or wrong breathing pattern. It is completely individual to you. Try to start out by breathing every 3 or 4 arm pulls and see how long you can maintain it. You will probably switch to breathing every stroke as your distance and time increases. This is perfectly normal. The best thing is to experiment with what works best for you but whatever you do, exhale before you inhale! My best-selling book How To Swim Front Crawl contains all the relevant practical exercises you need to fine-tune your technique, including your breathing. You can download it, print out the parts you need and take them to your pool to try out. Click the link below for more information. I need some swimming breathing tips. I am 57 and learning to swim. I have a great instructor and love it. The problem is getting my head out of the water to get a breath when I need it. I end up sputtering and getting water in my mouth and nose. It is almost as if I forget how to inhale a breath. The other adults seem to have the same problem with breathing technique. We even put ducks in the water so that I will know that I am out of the water. I may get the breath once or twice but then it just doesn't happen. Again, I love swimming and plan to make it a part of my life forever. I feel like the water and I are one, but I have to be able to breathe. I am able to hold my breath for 20 seconds under water, but when I don't get the breath I begin to feel desparate and stand up in the pool (a habit I don't want to continue). The water is one of the most freeing places I have been and although I respect it, I am not afraid of it. Don't know what took me so long to get in. There are a few things that can contribute to your problem of raising your head out of the water to breathe. Firstly as you have not mentioned which stroke you swim, I will assume you are doing breaststroke. If you are not then I would very much encourage it. As an adult learning to swim, it is the easiest to learn and the easiest to breathe. 1)	Make sure you exhale slowly when your head/face is submerged (blow bubbles!). That way, when you need to breathe in it is much easier. If you hold your breath, when you raise your head to breath, you need to exhale and then inhale again in the brief second you have face above the water - which is far more difficult. 2)	If you forget to exhale, then you will constantly be inhaling until your lungs can inhale no more! This will give you the feeling of 'forgetting how to breathe'. 3)	Try to breathe before you really need to. In other words, don't swim to the point of nearly running out of breath - breath long before that. This can sometimes make breathing more comfortable and natural instead of gasping for breath. As your swimming develops, your lung capacity and fitness will grow and you will be able to go for longer without breathing. Keep it simple and comfortable for now. The act of getting your head and face out of the water to breathe comes with a combination of technique and relaxing during your stroke. A good breaststroke leg kick and arm pull with give your body the lift needed to raise your head. Relaxing during your stroke will make you more buoyant and therefore make it easier to move and breathe in general. Feel your way through the water, don't fight with it!